So, the other day I transferred my old Mac to another, brand new one. There are several methods, I know. However, since I’ve set up a NAS TimeMachine drive (a satisfied owner of WD My Book Live 3TB) a long while ago and have religiously done TimeMachine back-ups, I preferred the TimeMachine route of doing migration with Apple’s own Migration Assistant. The whole affair was a breeze, save for some hiccups which are mistakes on my part: halfway-through I realized that I was restoring on a lowly 802.11g connection. I cancelled it and opted for the Ethernet connection. What had taken me half an hour to get halfway-through, got done in less than half an hour. Mileage may vary since I had only 128GB drive on my old MBA, with less than half of it full. Anyway, after the migration, I could never successfully do TimeMachine back-ups on the new machine. This darned window kept popping up. The problem is, I could connect flawlessly to the NAS drive, either through SMB or Apples’s AFP. I could browse contents on it, and even could see the contents of the TimeMachine back-ups in the separate TimeMachine volume on the NAS drive. I could see that the last back-up on the drive was exactly prior to migration. I made sure I did that before migration. So, what gives? As usual, a cursory search on Google led me to this great article on a blog that covered TimeMachine in great detail, titled “Reconnecting to Your Back-ups”. So, you have to go there and read it yourself to get the real deal, but these are the steps I’ve taken to get TimeMachine back to work again with WD My Book Live NAS drive. Make sure NAS drive is up and running well. Check all network connections and make sure you can connect to it through SMB and AFP. 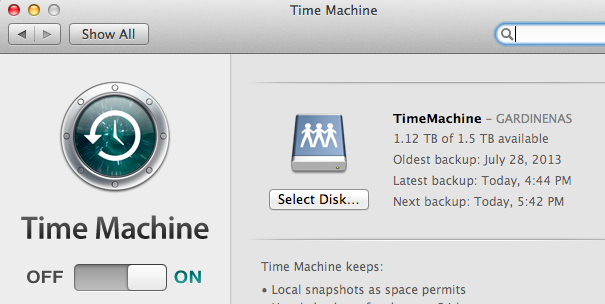 Make sure your TimeMachine back-ups exist. Make sure you can see your sparse bundle. Drill down your TimeMachine drive until you see it. Follow the instructions in the blue box on this page, titled ‘”Inherit” a backup’. Make sure you follow the instructions in the green box too, where indicated. Follow the instructions in the pink box on this page, titled ‘”Associate” an OSX volume’. Make sure you follow the instructions in the green box too, where indicated. Try to do a TimeMachine on-demand back-up. If everything goes well, your old TimeMachine back-ups will be reconnected to the new machine, and you’ll be able to make new ones with TimeMachine. This entry was posted on Sunday, 22 September 2013 at 17:09 and filed under Excerpts from the Real World. You can follow any responses to this entry through the RSS feed.